The old Santa Fe Trail was established in 1821, and the area has been a focal point for new ideas blended with old traditions and a sense of history ever since. Santa Fe is a unique blend of culture, history, art, ideas, activities, culinary adventure and even some pretty good golf about five hours south of Denver. The Rosewood Inn of the Anasazi, which by modern standards is intimate with 58 rooms, is an excellent downtown lodging option. Rooms feature local art and Southwestern touches, and your dog is even welcome at the Anasazi. The restaurant was just updated, into revamped bar adjacent to a tequila lounge area that leads into the dining area. Try the Trout BLT for something different. The La Fonda on the Plaza is the oldest hotel is Sante Fe. Originally built as an iconic Harvey Hotel in 1922, it has undergone significant renovation. The Terrace Suites in the La Fonda is almost a hotel within a hotel with a concierge, separate entrances, and private amenities. The hotel boasts original art in the hallways and great rooms. If you want to roam downtown, this is the cultural epicenter, with just about everything equal walking distance from the La Fonda. The Hilton Santa Fe Buffalo Thunder at 16 minutes north of the city center on Route 84 gives you a full-fledged casino resort close to the artistic action. Each room has a kiva or a small indian fireplace for a cultural touch. The spaciously appointed suites are the best option at the Buffalo Thunder. If you want the ultimate, then the Governor’s Suite is the over-the-top lodging option. The lobby and halls serve as a Native American art exhibit, and the Hotel has the largest conference center in the area. The Red Sage is THE steakhouse in the area with local steaks and buffalo with interesting sides such as spicy spaghetti squash. Dining in Santa Fe goes in every direction. Imagine artists as chefs with extreme individuality, attention to detail and combine that with a little gunslinger attitude. Sure, they get along, but there is some of who is the biggest-bawdiest-best in the bunch mentality. Their creative competitiveness is your culinary gain. The Tune-Up Café serves from breakfast to dinner with an El Salvadoran twist. You order at the counter, yet the food is incredible. French toast to tilt the Eifel tower and the best steak & eggs plate in town. Andiamo is a great Italian option, with the standouts of the Lasagna Bolognese and the Penne with Spicy House-made Lamb Sausage, ingredients made on premises. The profiteroles, puffed pastry with ice cream will make you think about Naples. Want Southwestern dishes in a festive & Mexican Deco atmosphere? La Choza serves red chili & green chili themed dishes, and an array of vegetarian items. Wash down the magnificent Chili Rellenos and the enchiladas with one of the vast array of margaritas. 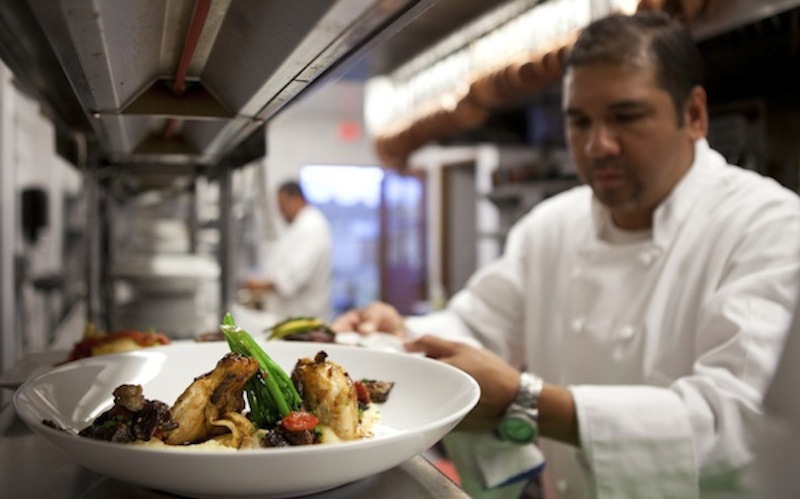 Chef Martin Rios, a Beard finalist, is the Picasso of the kitchen at Restaurant Martin. Each creation is a blend of exceptional creativity, taste, and plating. Standouts include the crispy Berkshire Pork Tenderloin and the Pan Seared Atlantic Salmon. Rios is the creator of the best side dish ever: the truffle orzo mac & cheese. The Soft Chocolate Decadence with hazelnut ice cream is representative of his culinary mastery – creativity, balance and visual appeal with everything made on the premises. Saddle up at the Cowgirl BBQ when you need some drenched meat and some brew as a chaser. Their El Diablo sauce is by far the hottest and best BBQ sauce on the planet. The Mother Burger is a beef-bacon-bison combination with green chili, cheese, tomato and truffle fries. This wins the local votes in the chili cheeseburger trail competition just about every year. History and fine dining combine at Eloisa, the home of Chef John Rivera Sedlar, with a family tie to his aunt, Jeronima, who cooked for the artist Georgia O’Keeffe. Best described as southwestern adventure dining with dishes like Pastrami tacos and Potato Encrusted Scallops. If you want a Sage Martini, the bar is the after-work scene with the vast collection of craft cocktails. Open just a few months, the Fire & Hops Gastropub features fantastic pub food with an unusual selection. The choices include the risotto with beets and goat cheese, slow roasted shepherds lamb, and a sesame noodle salad. Cap the night with beer ice cream made on site. Now that is a good use of an IPA. Golf is just as good and diverse as the eateries. Cochiti is about 35 minutes from Downtown. The holes meander through the elevated mesa with direction changes that make each hole different. It is serene, relaxing and visually pleasing at the same time with incredible conditions. The Kiva restaurant on site has been improved to feature cook to order food, which is far better than average golf course fare, so plan on eating there for lunch during your round. The Towa Golf Club is three separate nines adjacent to the Buffalo Thunder. Choose from Valley, Pinion and Boulders courses all of which are visually stunning. From the courses you have an unobstructed view of the ski area to the east and Espanola valley to the west. Boredom is not on the golf menu here. Extensive renovations starting in 2014 included removing 28 bunkers on the three courses, and re-forming the rest of the traps as more player-friendly. The Black Mesa Golf Club about 37 minutes north of town, is links golf combined with Mesa geography. Warm up before you play as you will need every shot you have to navigate the course. About three years ago, Black Mesa had turf problems, but an infusion of resources from the Santa Clara tribe is quickly remedying the situation. Sante Fe has an impressive spirits industry that is ramping up in artistic fashion enchanted twists on old favorites. Sante Fe Spirits sprung from a local orchard, with the first product an Apple brandy. Their most famous product, the Colkegan whiskey is smoked with mesquite wood. Their Wheeler’s Gin uses sage and cholla blossoms among other botanicals, while their Atapino liqueur uses pinon nuts. The Estrella Del Norte Vineyards are 25 minutes north of downtown and have won numerous awards for their Pinot Noir. Their Holy Mole is a red wine combined with almond and chocolate. The Black Mesa Winery, not far from the Black Mesa Golf Club, about 45 minutes north of Santa Fe and also has a tasting room in Taos. The 2011 Cabernet won a Jefferson Cup merit award, and you can share a pour with Sola, the winery cat. Need to relax? The Wo’ P’in at the Buffalo Thunder has a full-service salon and exceptional wet areas. The expression means “Medicine Mountain,” and they have an herbalist on staff that mixes local organic products used in the treatments. The Desert Sage Massage uses local sage oil to enhance the head, scalp and body massage. The New Mexico National Guard History Museum features an extensive display of memorabilia from the Bataan Death March of WWII. The 200th and 515th Coast Artillery regiments from New Mexico only had 900 survivors of this ordeal from 1800 who started. Remember their service, sacrifice and suffering with a visit.